ATS has been the credit union’s long-term IT partner who assists with IT strategy planning, implementation, and operations. The credit union is currently operating with over $200 million in assets and about 5,000 members. A new, effective email spam filtering service to replace the outdated service. Address unexpected network issues in a timely manner to minimize disruptions, identify technology trends, and optimize security. Exclaimer Mail Disclaimers to allow system administrators to populate individual users’ signatures for consistency, branding, and regularly-modified banner ads. ZixGateway Email Encryption to enable the credit union to communicate with National Credit Union Association (NCUA) easily and securely. Bandwidth management – When the credit union was experiencing slow network speed, ATS implemented Riverbed bandwidth optimization solution to optimize Internet bandwidth capacity. 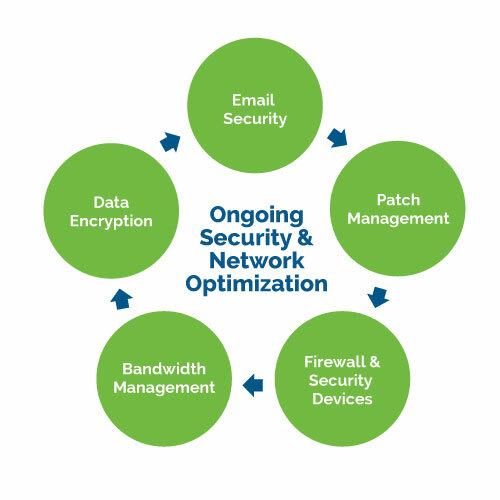 Firewall and security devices – Besides existing network security measures, ATS also maintained industry-specific security devices that connect the credit union with other financial institutions like the Federal Reserve Banks’ Fedline Access Solution and ShareOne Credit Union Information System Software. Patch management – The leading patch management solution Shavlik was implemented to constantly manage and update security patches, maintaining the credit union’s compliance regarding secure information including members’ confidential, personal information. Mimecast Email Security delivers a user-friendly, simple yet secure email communications among internal staff and with institutions like the NCUA and Federal Reserve. The Riverbed Bandwidth Optimization solution helped reduce 80% of direct traffic to the Internet, avoiding unproductive bandwidth utilization. Consistenly meeting compliance and adhering to fast-changing industry guidelines, the credit union continues to bring its members outstanding services as well as peace of mind knowing their critical information is safeguarded.